When you are out on the water, wearing sunglasses is second nature. However, the pair of shades that you use on a regular basis may not be strong enough for when you are fishing. This is because the sun beating down on you and the glare reflecting off the water can be quite hard on your eyes. To protect them from damage and to allow you to see clearly, you are going to require a pair of the best fishing sunglasses. The following sunglasses have all of the features necessary to protect your eyes, help see the water more clearly, and to sit comfortably on your face. There are a lot more aspects to choosing sunglasses for fishing than you might have imagined. Sunglass lenses are typically either made from plastic or glass. The plastic lenses are largely made up of polycarbonate material. The main advantage with glass lenses is that they offer greater clarity and tend to resistant to minor scratches. Of course, the downside is that the lenses are heavier and can break or crack quite easily. As technology has progressed, the optical differences between plastic and glass lenses have diminished. In many ways, certain plastic lenses are on par with glass in terms of clearness. Plastic lenses are favored because they are lighter and are less prone to shattering. There are five common types of lens colors used with fishing sunglasses – amber, yellow, smoky, polarized, and photochromic. The first thing you should understand about the variation in lenses is that each option has its own advantages. It is difficult to say that one is better than the other because they each work well in particular conditions. For instance, amber lenses are beneficial when fishing in shallow streams or lakes. They improve the contrast between different features in your surroundings. Therefore, it is easier to discern between the water and the sky. These lenses are also quite useful on overcast days as they can help you to see better through the gloom. Yellow colored lenses are also good for gloomy conditions. This is because they make it easier to distinguish between the shades of blue around by filtering out blue light. On the other hand, if you are fishing in bright sunshine, smoky glasses will provide greater clarity of vision. Not only does it cut down on the overall brightness, it also helps to differentiate between colors. Polarized lenses tend to be the most popular option among anglers. This is because it helps to diminish the glare that is reflected off the water. It also allows for a greater field of vision, even letting you see greater depths in the water. Polarized lenses don’t tend to work as well in regular life as looking at certain displays through these lenses can make images appear distorted. Photochromic lenses are also gaining traction among anglers. These lenses change according to the light in your surroundings. For instance, if the sun is very bright, the lens will darken to offer greater protection. As the light dims, the lenses will clear to allow greater amounts of light through. The majority of the weight of your sunglasses is carried in the frames. Considering that you will be wearing your sunglasses for hours on end, you should look for a pair that is lightweight. With fishing sunglasses, the right fit is determined by the style of the shades. It can be difficult to recommend one style over the other since it is your face shape that will conclude which style is right. Therefore, what may fit one angler perfectly may be too large or too small for another. Nonetheless, there are a few things to keep in mind when looking for the frame. The first thing that you frame should do is to cover your eyes as much as possible. This means that there should be no space in the periphery where the glare can still enter. You are also going to need a pair that will stay on your head even with some movement. Therefore, opt for arms that stay close to or wrap around your head. 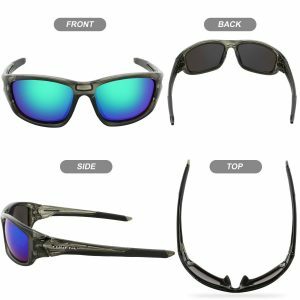 There are lots of extra features available that can really make a pair of fishing sunglasses stand out. One of these is the hydrophobic coating that is applied to the lenses. This allows the water droplets to simply slide off the lenses. Then there are ones that prevent the inside of the glasses from fogging. This is particularly useful in climates that tend to be quite humid. Let’s take a closer look at the conditions that the sunglasses on this list can be best used for. The Costa Del Mar Brine sunglasses are for anglers who spend their time out on the ocean. The lenses and frames of these glasses have been specifically designed to withstand saltwater conditions. The Del Mar Brine shades are 99.9 polarized, which means that most of the glare and harmful UV rays are filtered before reaching your eyes. Despite this, your clarity is not compromised in any way. 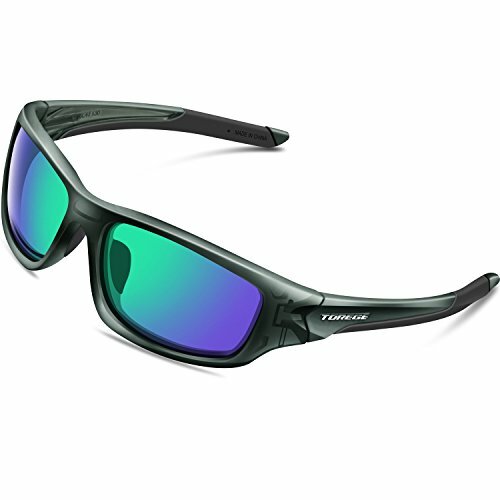 These glasses offer several lens colors, each to suit your specific fishing conditions. They also wrap around your face, ensuring that no additional light is passing through. While the lenses are incredibly lightweight, they are also quite durable. The lenses have been constructed to be scratch-proof and impact resistance. They are also resistant to water and oil, ensuring that the surface remains smudge free. The frames are made from co-injected bio based nylon which not only makes it light and flexible but also incredibly tough. The glasses are comfortable, complete with non-slip temples which help the glasses stay on even when wrestling with a catch. The frames are resistant to extreme temperatures and are made to last for a long time. The frame of the Smith Optics Guide’s Choice sunglasses may seem oversized. This, however, is to ensure that the frames completely cover your eyes, preventing the glare from all sides and angles. The wide temple design allows helps to avert fogging up the glasses by providing enough of space for your breath to pass through. There are also hydrophilic nose and temple pads that help to keep the glasses firmly planted on your face, even when you are sweating profusely. While the frames are lightweight and durable, what really stands out about these glasses are the Chromapop+ polarized lenses. The lenses work to reduce the glare and to deflect UV rays while still maintaining perfect clarity. This allows for greater discrimination between colors and makes it easier to see even in the brightest of conditions. The lenses are hydrophobic which means that even if you are splashed with water, the beads will simply roll off. These glasses come with an integrated but detachable leash to prevent your shades from falling off. The Maui Jim Stingray sunglasses are ideal for individuals who don’t want colors to be dimmed while their eyes are being shaded from the sun. The PolarizedPlus2 technology used for these lenses assure this. The lenses do an excellent job of cutting out the glare – they successfully block out a 100 percent of the UV rays. They are suitable for very sunny days where the glare is quite bright. At the same time, it maintains the richness of colors. Not only does this make it easier to distinguish between objects and colors, it also helps with depth. With these sunglasses on, monitoring fish at a greater depth becomes easier. The lenses are also made from SuperThin glass. This makes around 20 percent lighter than the typical lenses used in sunglasses. At the same time, these lenses are incredibly strong. They have been to be both shatter resistant as well as scratch and solvent resistance. The frames are made from durable, composite material. They have been designed to hug the contours of your face to prevent the shades from moving around. The Flying Fisherman Buchanan offers complete coverage from the sun, with a large, wide frame that wraps around the sides of your head. The frame is made from polycarbonate and is very lightweight. The rubber nose pads are vented to ensure that not only do the sunglasses sit on your face comfortably, there is a reduced chance of sweat accumulating there. There are also extended temple pads for added comfort. The lenses also have several advantageous features. There are made of polarized triacetate material, which completely blocks out UV rays and reduces glare as well. They have been associated with minimizing eye fatigue too. These lenses are quite tough and have been designed to restrict scratches and can even withstand making impact with the ground or other surfaces. The lenses also utilize the AcuTint coloring system. This means that although the lenses are capable of dimming the sunlight that filters in, there is no color distortion. You can easily make out the discrepancies in the colors and shades, providing you with a greater level of clarity while fishing. 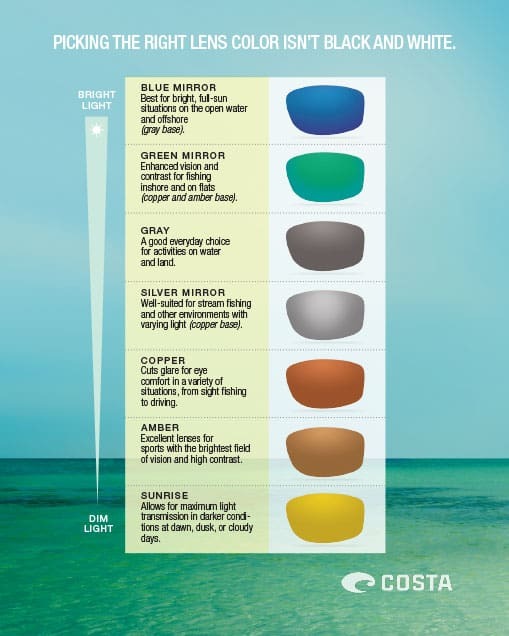 There are various tints available to suit the conditions you will be fishing in. The main advantage of the Suncloud Zephyr sunglasses is that they are incredibly light. 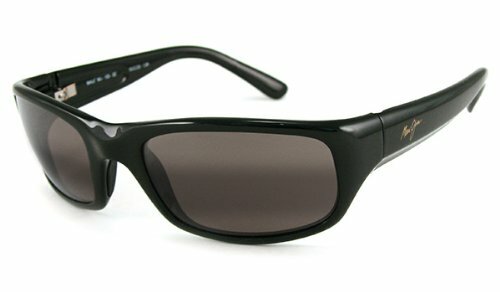 As the grilamid frame runs only along the upper part of the shades, there is no pressure on your face. The megol nose pads help to keep the glasses on your face. The temple pads also work to prevent the sunglasses from shifting while you are fishing. Although there is limited framing, the lenses are large enough to make sure that your peripheral vision is protected as well and that no glare is entering. These type of sunglasses are excellent for humid conditions. This allows for plenty of airflow preventing the lenses from fogging up. The lenses are constructed from polarized injection polycarbonate. In addition to cutting out UV rays, reducing the glare, and maintaining clarity, these lenses are also strong. 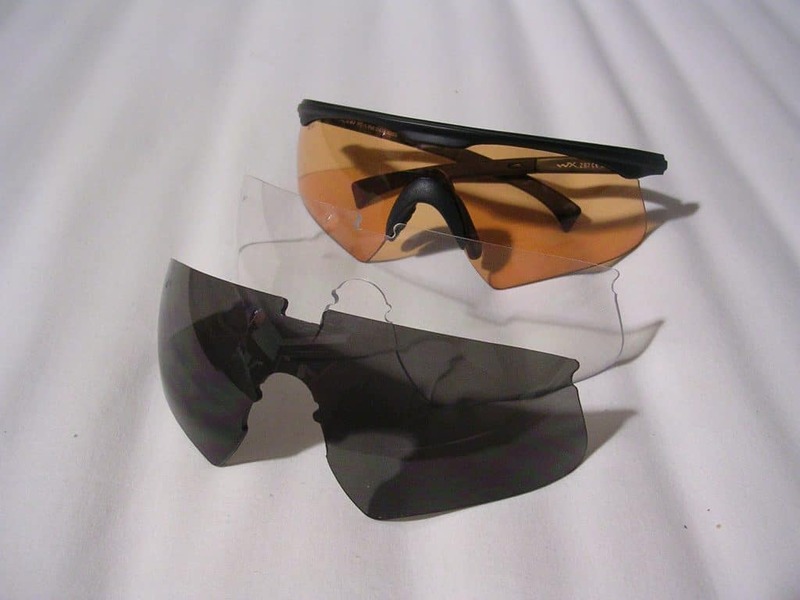 Even when dropped or used roughly, it is unlikely that the frames or the lenses will show damage or distortion. The Zephyr sunglasses are best used in medium strength sunlight. In these conditions, the lenses will keep out the glare but still help you to differentiate between the colors out on the water. If you are looking for a pliable and tough pair of sunglasses then the Torege Sports sunglasses will suit you well. Unlike many other sunglass frames, is incredibly flexible due to its thin and lightweight design. This is an advantage because the frame has been constructed to be nearly indestructible. Although it bends, it will not break. The REVO lenses are polarized and have a UV400 protection coating on the exterior. As a result, all of the UV rays are blocked but there is no reflected or scattered light. Due to this, the image is clearer with more distinction for both color and detail. The lenses are actually made up of seven different layers. In addition to the UV protection and polarization layers, there are also bonding layers. These work to improve the durability of the lenses. There are also two layers that are specifically created to prevent the lenses from shattering if the shades fall to the ground. They are also scratch resistant. The lenses come in different colors to suit a variety of weather conditions. You can choose between a gray, blue, green, and rainbow lens, depending on how much light transmission you want. 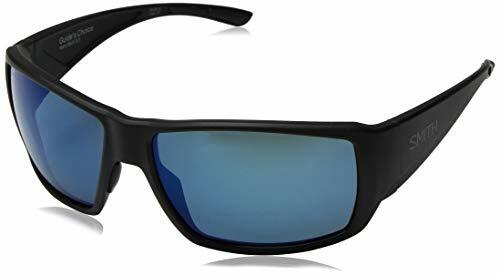 It is difficult to pinpoint just one set of fishing sunglasses that can be used for a variety of fishing situations. If you want to be well protected regardless of the time of day, location, or weather, you should consider investing in more than one pair. You should find everything that you need right here, including some excellent fishing sunglass options. Tauten LineWelder Review- The End of Tying Knots? Do Cordless Drill Ice Augers Really Work? Follow us to be notified of our giveaways, contests and promotions. Disclosure: Some of the links are affiliate links. This means that if you choose to make a purchase, your price remains the same and We will receive a small commission. Amazon and the Amazon logo are trademarks of Amazon.com, Inc. or its affiliates Thanks for your support!